Welcome to my first tutorial on Flutter. I have never written any post on cross-platform or hybrid app framework but Flutter has changed this mindset of mine. Previously, I have developed on React Native, Cordova, Phone Gap, Ionic and now of these really work out for me until I found Flutter along with its huge community of developers and its showcase apps. In a nutshell, it is a multi-layered system, such that higher layers are easier to use and allow you to express a lot with little code and lower layers give you more control at the expense of having to deal with some complexity. In Flutter, it is all about Widgets. Widgets are the elements that affect and control the view and interface to an app. Flutter renders the widget tree and paints it to a platform canvas. This is nice and simple (and fast). It’s Hot-Reload capability allows real-time development experience. You can read more about Flutter and learn about its goodness here. 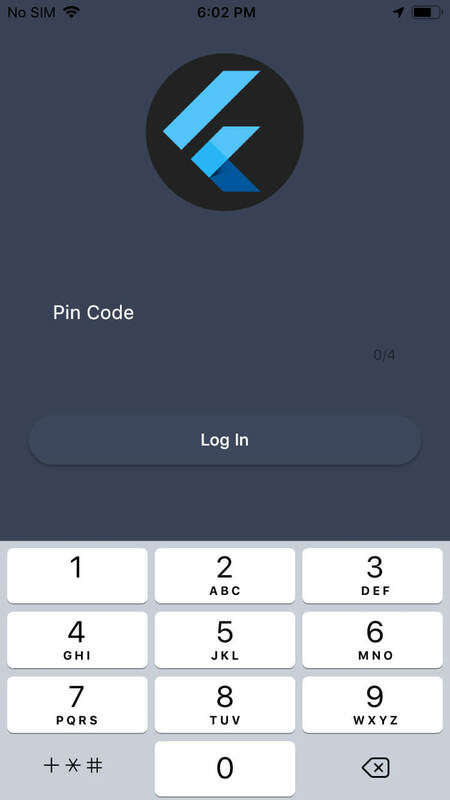 Login via a Pin Code. 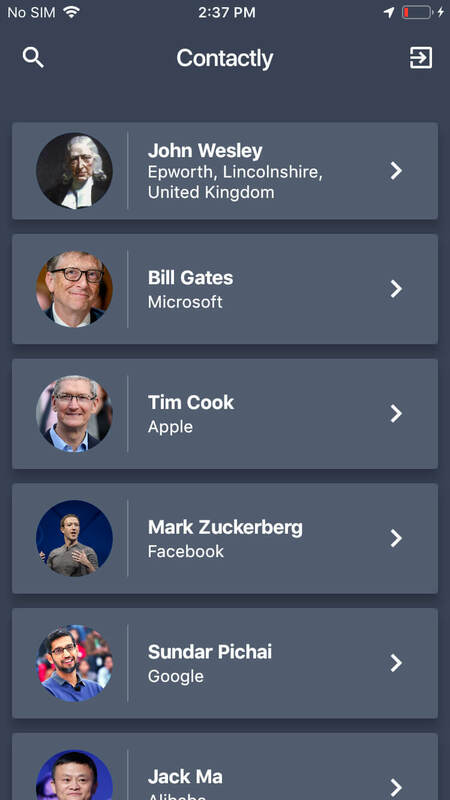 Load a list of contacts from JSON. Search for a particular contact. Tap to view contact details. Tap to view contact info in an external browser. android – for generating the Android app. And, in case you need to add an Android platform-specific implementation, you will implement it here. ios – for generating the iOS app. And, in case you need to add an iOS platform-specific implementation, you will implement it here. lib – contains the main code of your application. Later, you will see we create all the code files here. test – for unit testing. However, we will not go into it in this tutorial. I know you can’t wait to try out Flutter. Let’s dive in and set up all the required tools on your machine. I cannot guarantee that my tutorial will work for every configuration and platform, hence, I will not include configuration troubleshooting here to keep this tutorial short and objective-oriented. 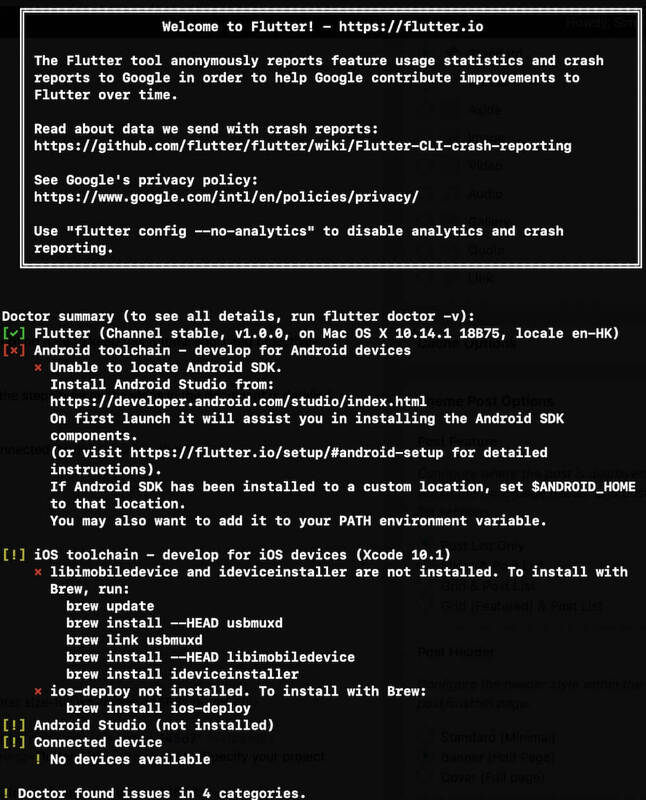 First up, head over to Flutter Installation page to install Flutter. I will skip the steps here as the steps in the document is detailed enough. Once you run flutter doctor and you got (1~4 checked), you are good to go! It’s not necessary to have Connected Devices checked. If you have encountered any errors like below, follow the suggested solutions to fix it. For example, if your Mac has not installed with Android Studio, head over to this website to download the software. Just make sure you have the first 4 items checked before moving on. 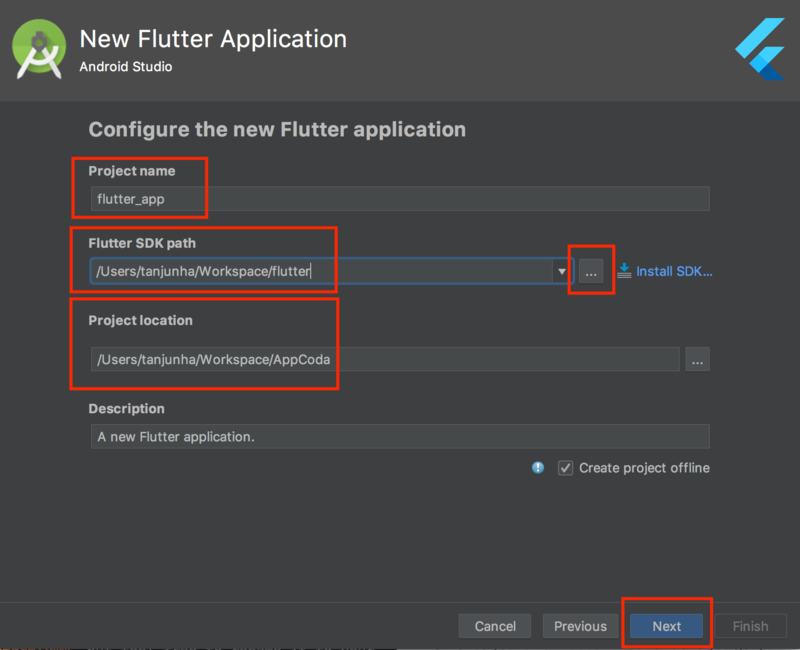 With Flutter installed, now let’s start to build your first Flutter project. 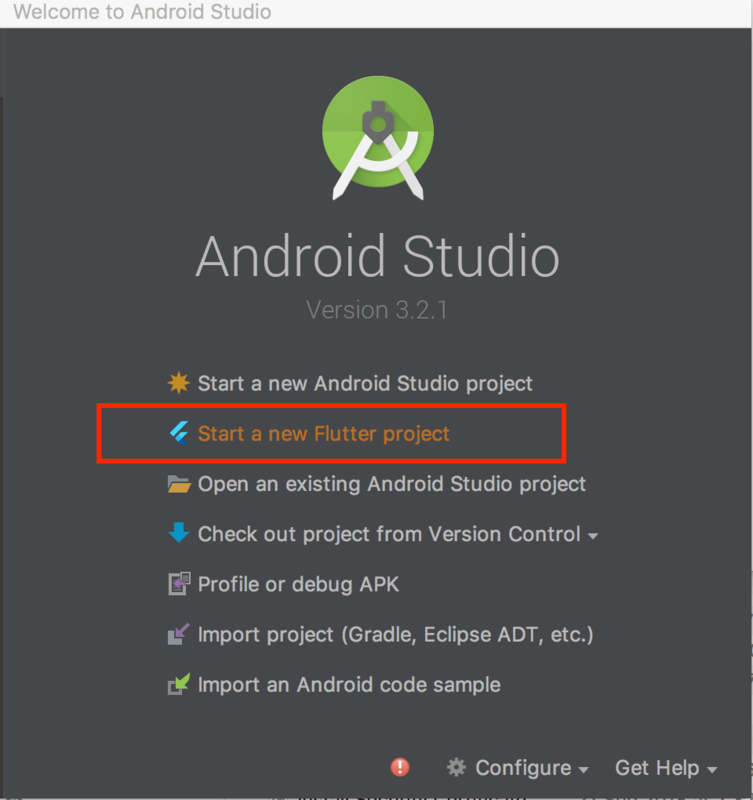 First, fire up Android Studio and click Start a new Flutter Project. Next, select Flutter Application and click Next. Then fill in Project name as contactly, or anything you like. By default, it should show your default path of the Flutter path. 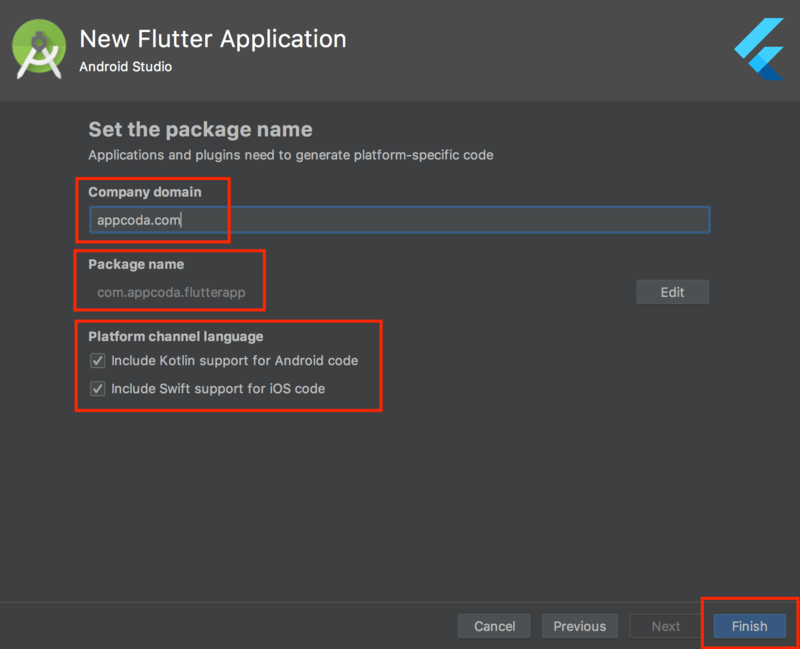 In case it doesn’t work for you, navigate and specify your own Flutter SDK path. Optionally, you can change your project location and give a simple description. Then, click Next. Finally, fill in a Company domain. This will be replicated in your Bundle Identifier (iOS) & Package Name (Android). For my case, I checked both Kotlin & Swift support. Then, click Finish. Once you started your Flutter Application, some boilerplate code is automatically generated with a sample app that allows you to hit a button and perform some text updates. Before we make any code changes, it is a good checkpoint to try running it on your iOS simulator. To run the app, find the dropdown list somewhere at the top right that says <no devices>, click on it and select Open iOS Simulator. Your last selected simulator hardware will be chosen, which is iPhone XR for my case. Click Run, which is the green triangle, and the app should open in your simulator. You should be able to interact with the Demo app and push a few buttons! With the demo app running successfully, we are now ready to start building our first Flutter App! Let’s start by deleting all the code in main.dart. Yes! Press command-a to select the whole code snippet and hit Delete. It’s always a good practice to organize files into separate packages and put the constants in a separate. So, let’s create the helper package and the Constants.dart file to place some of our constant values we will be using in this app. Right-click on the lib folder and then select New > Package. Name the package helpers. Now we have a separate folder to store our helper classes. 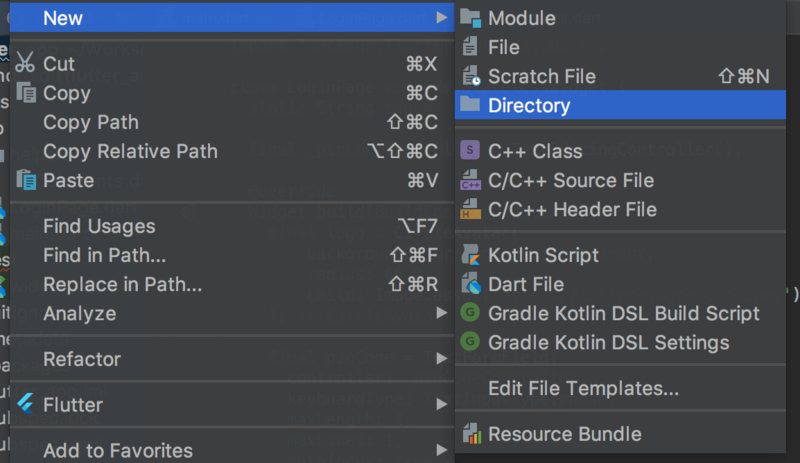 To create a new dart file, right-click on helpers and then select New > File. Name it Constants.dart. Here we import the same material package, so we can use the Color declaration and declare an appTitle to be used app-wide. Now head back to main.dart and add this import statement after the first import line. MaterialApp is one of the convenience widgets which allows customisations like adding navigation routes, appBar etc. Setting debugShowCheckedModeBanner to false will get rid of the Red Debug label at the top right. We use our declared appTitle in our constant file here to give it a title. Then, we set the primaryColor. All the code looks good here and you might be eager to try running it. If you really did, you will get a huge red-colored error screen! This is because we are not yet ready to paint the canvas. Be Patient! In most tutorials, they will guide you on building everything into main.dart. But I find that we could make it cleaner by separating each page into separate files, which you will be eventually doing so when building production-ready apps. Now let’s go ahead to create a new page called LoginPage.dart and place it under lib. Perform the same ritual of importing material package. Here we will be creating a Stateless Widget since we don’t need to store any form of data. You can find more details about Stateless VS Stateful here. To implement the screen component, insert the following code. Just copy & paste it first, we will go through them in awhile! As mentioned earlier, we will be creating a stateless widget for our LoginPage here. This is why we extend the class from StatelessWidget. Since the app has a text file for user input, we will instantiate an instance of TextEditingController here, which has a main responsibility of handling all text editing logic. First, we have our logo. It is embedded in a Circular Frame by using the CircularAvatar class. It also has an appLogo image. If you run the app now, you will probably end up with an error saying that the image asset cannot be loaded. We know the path is given to load the Image but there are 2 missing pieces: the image itself and the path that we need to include in pubspec.yaml. First, you can get the logo image I use from here. Then, create a new directory called assets in the root directory, and create a sub-directory called images. Your image should be placed in root/assets/images. Then, go to pubspec.yaml and add the following code to inform the app what assets to bundle together during runtime so it can be loaded. Now that we have our logo loaded properly, let’s move to the next UI item, pinCode. It is a TextFormField. We set our _pinCodeController under this TextFormField with a prefix _ which tells the compiler that this variable is private. You can read the settings as most are self-explanatory like keyboardType is phone, maxLength is 4 characters, maxLines is 1, autoFocus set to true to straightaway trigger keyboard when page is displayed. We also give the textfield a simple styling using decoration and style. Next, our loginButton. We create a padding on all sides (left, right, top, bottom) using symmetric. We also use RaisedButton which automatically comes with the elevation UI effect when user interacts with it. Lastly, we return the main UI structural class called Scaffold which sticks all our newly created UI components together in a ListView. Cool, right? Let’s continue to build the rest of the screens. The first class HomePage will be called and used when navigating/presenting the page, while the private class _HomePageState will be called everytime the HomePage is called. This is also the mutable state object which we will maintain as the page get called. Allowing navigation from LoginPage to HomePage (Routing). Populating JSON data and map to ListView. The code above allows us to use tags to associate each individual page. 🙂 Finally, let’s add the routes to our build function just after home. We can’t really test this out yet as we have not implemented the UI for our ListView. So, let’s do that first. The Record class to hold the data of each item. The RecordList class to hold the list of data. The RecordService class to perform the loading task. Dart provides factory constructors to support the factory pattern. The factory constructor is able to return values (objects). Here it parses the given JSON string and returns a Record instance, which represents a contact. Here, the loadRecords() function parses the records.json file and map it into a RecordList object, holding a list of Record objects. The keyword Future should be new to you if you are unfamiliar with Dart. To perform asynchronous operation in Dart, we use futures. Future objects (futures) represent the results of asynchronous operations. We declared _filter so we can implement a listener for our searches. We declared records to keep the state of our raw data, as well as filteredRecords to keep the state of searched data. We use _searchText to validate our searches. The _searchIcon is an Icon representation. The _appBarTitle is really just a text widget which we will use widely. In the init state of the home page, we empty our records data and get fresh data from the JSON file. Here we don’t need to really use an Async Call, but it is to introduce its concept and how you could call it if you were to perform a data fetch from a server. Here, we handle the mapping of our RecordList data into our ListVew, and also handle any searches performed. We used a given material design class called Card to create our Card-Like UI. title: It holds the name of the contact. subtitle: It is wrapped in Flexible to allow growing texts. trailing: It is a right arrow icon to signify interactivity. That’s it! Hit the run button and try to navigate the app from the login page to the home page! The search icon will change to the close icon. The appTitle will become a search field. 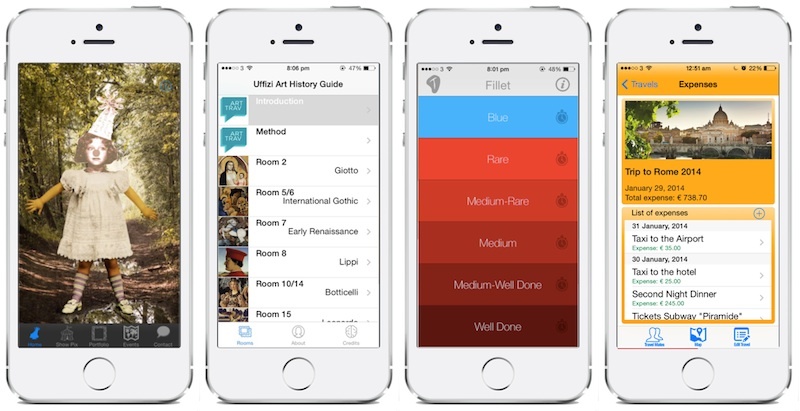 As we input search the text, the list will reload and re-render with the filtered results. Now you’re ready to go! 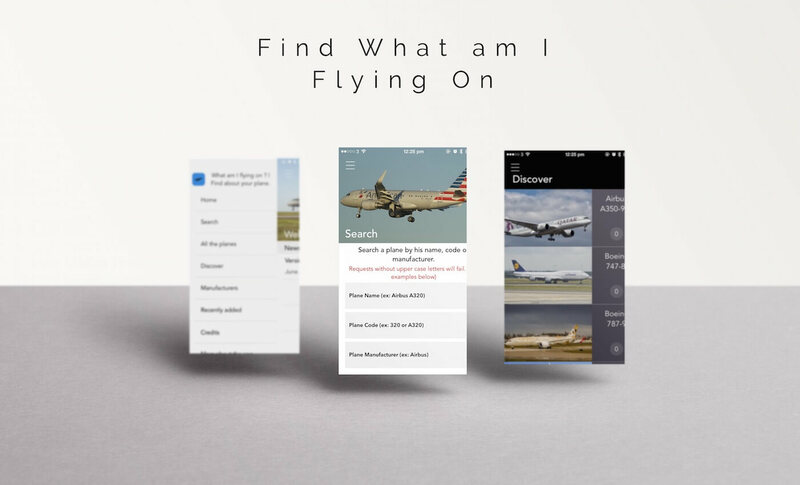 Try running the app now and perform some searches! like “Mark”. 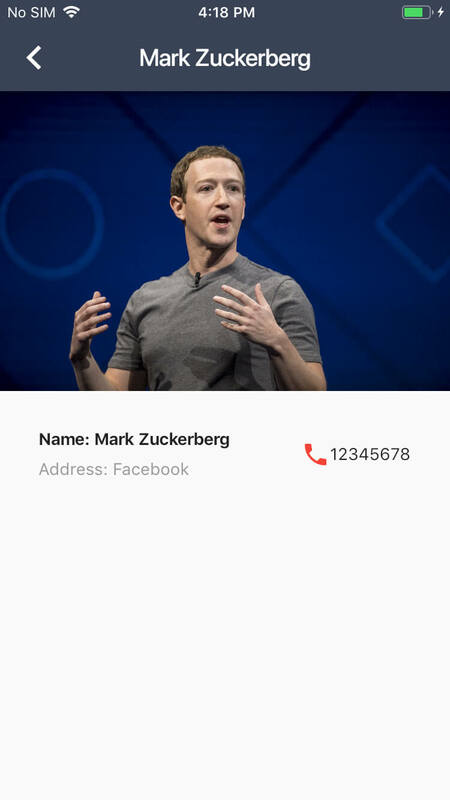 It shows the contact’s profile image, its name, address, and phone number. One hidden feature not shown here is to allow user to navigate to an external web browser to view the technology’s website. So let’s get started! // Code to create the view for name. // Code to create the view for address. // Icon to indicate the phone number. We create a StatelessWidget for our DetailsPage. We create a constructor to take in a Record object (i.e. the selected contact) from HomePage. 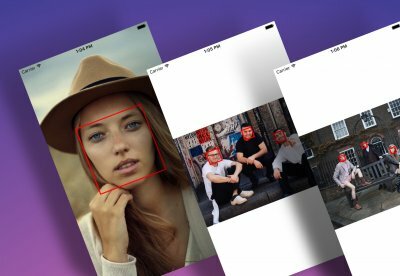 You should notice a new UI component called GestureDetector. As its name suggests, this widget class is designed to detect touches. When a user touches one of the fields, the app will call URLLauncher().launchURL(record.url) to load the URL in a web browser. This URLLauncher class is not ready yet. Let’s create a new file called URLLauncher.dart in the helpers directory. Here we add a line of configuration to load the url_launcher. After editing, run flutter packages get by hitting the Packages Get button. This is how we install extra packages to increase the capabilities of our app 🙂 Great! You have just gained another skill! 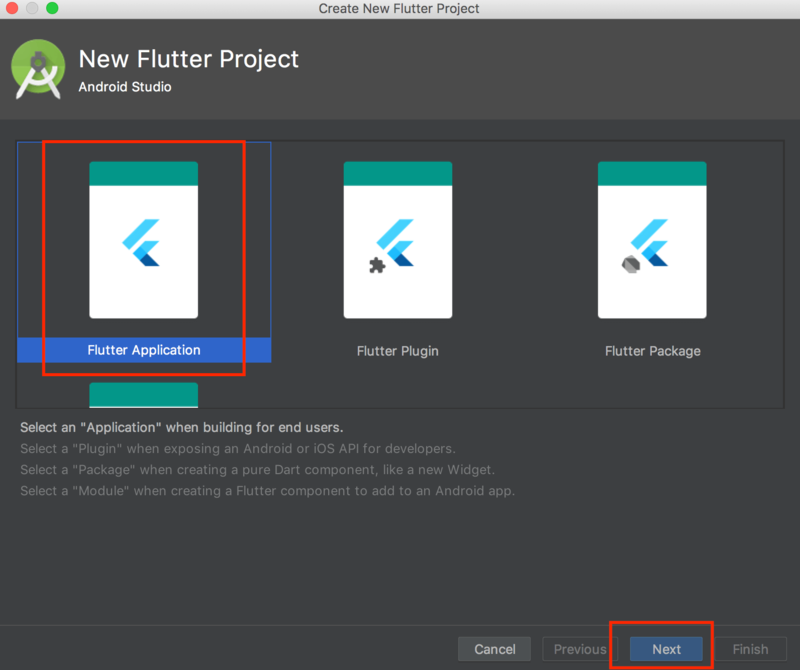 You have just gone through a very basic tutorial to get you started in developing on Flutter. In my own opinion, Flutter is developed based on the knowledge of popular mobile apps around where we can easily build UI components in just a few lines of codes. While its scalability is still questionable, we can see that Google and it’s community is investing a lot in this framework, and we could possibly forsee a bright future ahead for Flutter, striving past React Native. You can download the finished project here. Lawrence is a passionate iOS developer with over 3 years of commercial experience and had worked with clients from US, Europe & Asia. He's a tech addict and Swift enthusiast. When he's not writing code, he enjoys time with his pet Maltese and spending time with his loved ones.